The Defence Export Promotion Organization (DEPO), along with its major defence manufacturers, has been participating in various International Defence Exhibitions. The DEPO works to facilitate customer inquiries and coordinate export of a high quality of defence products and services. The DEPO works towards meeting the large network of services of the Pakistan Armed Forces. The DEPO, along with its major defence manufacturers, has been participating in various international activities and through its pro- active marketing strategy they have earned international recognition. DEPO has contributed to Pakistan exporting aircrafts, arms and ammunition to over 35 countries around the world, and during the last 2 years they have developed a strategy to explore new markets and expand its business plan. The DEPO, in collaboration with Pakistan's defence sector, is committed to providing a progressive response to ongoing developments in the world and to meet the technical needs of present whilst looking to prosperous future developments. 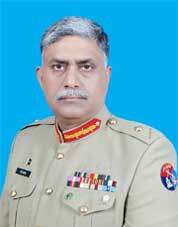 Maj Gen Ahmad Mahmood Hayat, HI(M), Director General DEPO, Pakistan. International Defence Exhibition and Seminar (IDEAS) is a mega regional event in South Asia; biennially organized by Defence Export Promotion Organization (DEPO) in Pakistan. A story of continuous successes since 2000, IDEAS is now an established rendezvous for convergence of international defence exhibitors, delegations, security analysts and top level policy planners; enabling IDEAS to attain an iconic standing on the canvas of global defence exhibitions. IDEAS is an ideal platform to showcase latest innovations in defence and technologies of future; with a variety of weapon systems and equipment on display. During the exhibition, defence and security outlook of the future is discussed through a series of conferences and a capstone seminar. It also brings together international manufacturers and suppliers of products and services to explore new horizons of defence cooperation through joint ventures, outsourcing and collaboration. Moreover, the high profile of visiting delegates adds to its prestige and stature. IDEAS truly demonstrates a successful public-private partnership model. Its participation and international attendance is a true reflection of our deeply embedded and mutually beneficial relations with international fraternity. In fact, IDEAS is a shared platform for global peace, stability and prosperity. IDEAS 2018, our 10th eventful edition is scheduled to be held at Expo Centre Karachi from 27- 30 November 2018.